The Idaho Falls Chukars score 3 runs in the bottom of the 8th inning as they won 7-4 to take 2 of the 3 games in the series against the Orem Owlz at Melaleuca Field. The game's starting pitchers, Orem's Cristopher Molina and Idaho Falls Rito Lugo each pitched well. Molina allowed 1 run on 3 hits in 5 innings. Molina struck out 6 in the game. Lugo allowed 3 runs in 4.1 innings but struck out 6 Owlz batters in the game. The Chukars got on the board in the bottom of the second inning as Jesus Atencio drove home Hunter Strong on an RBI double. It stayed 1-0 Chukars when Connor Fitzsimons drove home D'Shawn Knowles with a single to right to tie the game in the top of the 4th. Orem took a 4-1 after scoring 2 runs in the 5th and 1 in the 6th on a Francisco Del Valle home run. The Chukars scored 3 runs in the 6th to tie the game 4-4. Bubba Starling had an RBI double in the inning. Starling went 1 for 2 on the night. He is hitting .571 since joining the Chukars on a rehab assignment. Idaho Falls broke the 4-4 tie in the 8th inning by scoring 3 runs. Andres Martin led off the inning by getting hit by a pitch. With 1 out, Nick Hutchins was also hit by a pitch. A wild pitch by Sadrac Franco advanced both runners. Hunter Strong walked to load the bases. Atencio followed up with a game leading and eventual winning RBI to knock in Martin to make it a 5-4 lead. 2 scored later in the frame for the 40-32 Chukars, who are now 1 game behind the Grand Junction Rockies in the Southern division. 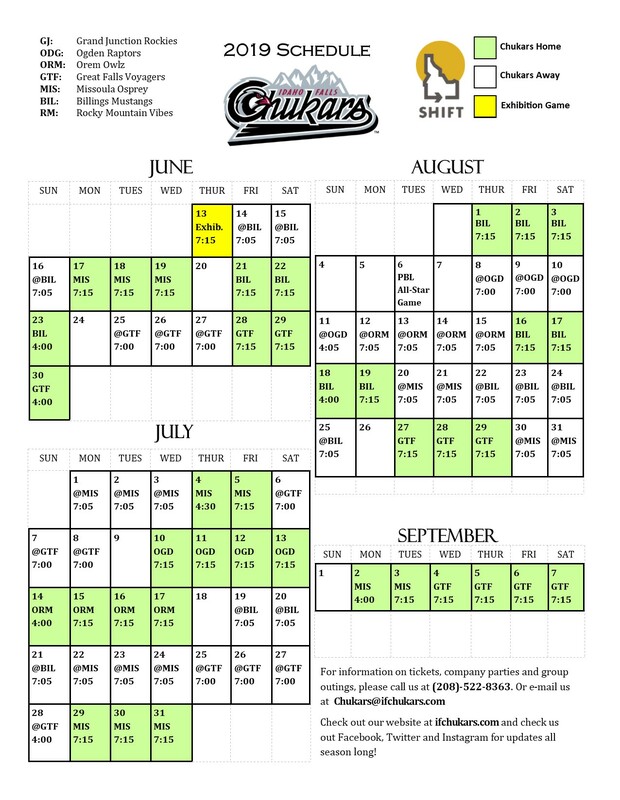 The Chukars made up an entire game in the standings as the Rockies lost 6-5 to the Ogden Raptors. There are 4 games left in the regular season. Idaho Falls plays the final 4 games at Melaleuca Field against the Raptors. The Rockies play their final 4 games against the Owlz. 2 games at Grand Junction and 2 more games at Orem. Labor Day is the opening game of the critical series against the Raptors. 4:00 pm first pitch at Melaleuca Field. Chukars notes: Nick Hutchins scored a run in the 8th inning but went 0 for 2 in the game. He was hit by a pitch in the 8th inning. His 9 game hitting streak comes to an end. Bubba Starling is 4 for 7 with 5 walks in a Chukars uniform He has had 3 at bats in each of his 4 games. Daniel James got his 2nd save of the season. Idaho Falls went 4 for 9 with runners in scoring position. This ended the season series with Orem. The Chukars went 10-6 against the last place Owlz. Time of game: 2:48. Attendance was 2,606 on Military Appreciation Night.